Back in June I asked for memories, thoughts provoked by this building. It is, as many of you knew, the old carriageworks canteen. It was part of a group of buildings at the entrance. These responses were brilliant, thank you. Thoughts follow underneath your words. to me it was a big dinnertime social hub, lots of railway men having their dinner, lots of banter going on, time to meet up with your mates who worked in different departments. Back in the early days when we worked all day on a friday, everybody went to the pub or club (Loco,Volunteer, Fox, Holgate Club, or Bowling Club) then it was a mad dash back to the canteen to get a bag of sausage & chips or just chips. Unfortunately my last memory of the building , is going back to pick up my redundancy cheque. To me it represents a lost part of York’s industrial and engineering heritage, and the neglect of 19th/20th Century history in favour of medieval king-chasing and pseudo-Vikingism. The sight of hundreds of workers leaving at 4:30 on a weekday afternoon. It was an area to avoid if you were in a rush to get anywhere. I don’t recognise it but I would guess that it’s a railway workshop of some sort. It’s odd, isn’t it, that although it has the NRM, there is so little public acknowledgement that York was a major centre of carriage making. York should not just treat all of its nineteenth century manufacturing heritage as low grade disposable buildings. Reminds me of the many menfolk in my wife’s family,earning their living,building Railway Carriages,using their various skilled (apprentice trained) ability’s . Particularly my Ex Sergeant Major WW2 Dad in Law,who was the no.1 Crane traverse driver,after the war,shifting all the carriages to/from work stations,to enable the many trades to apply their skills.Hard work leavened with a nice “Pint”in the Fox inn after work! ( not forgetting,before/during)! A VERY SAD LOSS to York’s wage earners. It’s another sign of another traditional York industry that has sadly gone, along with chocolate, the railways used to be a massive employer in the city, but no more. Very sad really. It’s a remnant of York’s recent industrial heritage – there are plenty still alive who will have trained and worked there – if they didn’t get killed by asbestos related diseases. Manchester are doing great things with buildings like that! Would be a great music venue or something similar. 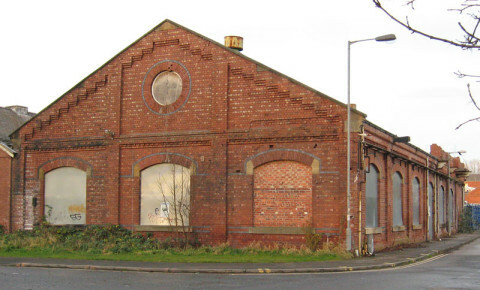 This was on the left of the main entrance to the Carriage Works, and was the works canteen. The furthest part of the building had an upper storey attached to it, you can still see the remains of the girder that supported this on the side of the building. There was also a detached house complete with mature garden in front of the canteen, where the cycle path now is. 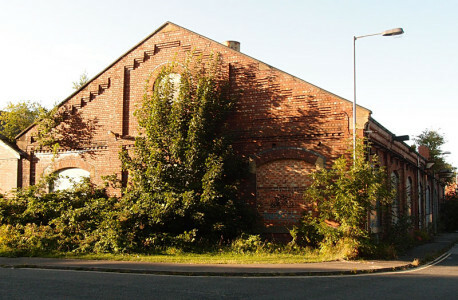 The majority of these buildings were demolished when the works closed, but the canteen was left as there were plans to convert it to a community centre. these plans fell through, but the building remains, although the proposed link road into the tear-drop development will be constructed here, so I suppose it could go at any time. My recollections are of this site in the mid sixties, and the throng of workers leaving on their bikes at the end of their shifts. I also remember in the summer months, workers sat on the stone wall of the culvert over holgate beck eating fish and chips bought from the chip shop at the corner of Park lane. No personal symbolism or meaning. I know it was a large employer at one point when stock was built in York. I visited there once whilst working for the council -2002, think for a training course. Appeared to be an underused resource (there you go – a symbol of decline). Soon to be demolished no doubt and one further lost reminder of York’s industrial and work-a-day past. But, potential for retrofitting for start up businesses, studios etc. oh yes. It looks disused, industrial, Victorian (?) but somewhat pleasant–I love the brickwork! Thoughts are the good times i spent working there. Only three years but unforgetable, so much fun to work there. Also the susidised meals in the canteen were very good. A trigger for memories of past times, I personally would like it to remain, because I feel too much is unnecessarily lost in regards to the protection of heritage. It makes me think of my late great grandfather, Tom Shepherdson, who worked for the North Eastern Railway as a joiner and who was killed by the Oxford to York Express in the course of his duties at Askham Bog signal box in January 1910 (I had a letter in The Press about this recently). He came from a long line of Shepherdsons from Catton near Stamford Bridge. All the Shepherdson men were joiners, carpenters or wheelrights (and probably the local undertaker too). I also think of the huge number of bikes that emerged from the Carriage works at 12 noon and tea-time. If you were behind them in a vehicle there was absolutely no chance of overtaking them. I have always had a strong image of it being a bustling factory, with workers (definitely all male) buzzing around amongst noise and sparks. This probably comes from the odd story my parents told me about the area and hundreds of men sat on the wall by the Fox Inn, all from the carriage works, having their fish and chips on a Friday afternoon, and what a sight it was. Their description was tinged with sadness. I lived in St. Paul’s Terrace for 5 years so I saw it regularly when I walked around the area. It reminds me of that period of my life (generally a good one). At the time, it made me a little sad to realise that the area was once full of similar buildings, all busy and working (I used to imagine people walking from St. Paul’s Terrace, Railway Terrace etc. to the gates just over the bridge on Cinder Lane to go to work in the mornings). The place might look forgotten, but the comments above show that it isn’t, and that it has other meanings too, even to people who perhaps don’t remember it as I do, and as many of you do, in the 70s, 80s, earlier, when it was part of the entrance to a thriving and busy place. It isn’t just about our memories. I thought that perhaps everyone who answered would be like me, remembering. There are other messages in the above, more general thoughts about York’s industrial heritage and our attitudes to it, and I hope that the comments above are read by those who get to decide on what gets demolished in this city and what’s considered to have value, to be worth retaining. This building, these comments suggest, is recognised as the aesthetically pleasing building it is (‘I love the brickwork’), and as having a bigger significance, as symbolising something we’re losing. I was also struck by, and cheered up by, the comment which mentions a memory of place being passed on: ‘My parents told me about the area and hundreds of men sat on the wall by the Fox Inn, all from the carriage works’. I happen to know some of those men from the carriage works. And I remember the carriageworks, and that entrance, that canteen, from when I passed it, thousands of times, over the years, on my way to school. I remember it closing, I remember visiting it in the mid 1990s before it closed. I have photos, press cuttings, and audio recordings from May 1995, and will be putting some of those things on these pages. Because it’s important, and it’s not being recorded enough, and leaving it in our memories or just chatting about it isn’t enough. Thank you to everyone who remembered, or was interested and cared even if you weren’t there to have known it personally as an important place. Thanks for recognising that it was. This building has no protection at all, which seems odd for a place which clearly has local meaning and value on many levels. There should be full consultation on what happens to it. This is one of several pages planned under the carriageworks category. It was sponsored by a reader. Thank you. I remember going in there every lunchtime in the late 1970s. I and two colleagues would play Bridge over the 1 hour break. We would each bid against a blind 4th hand. We got pretty good. I remember there was always the threat of site closure, even then, because the traversers could only take 21m coaches and the trend was to build them 23m long. We found ourselves competing with Derby Litchurch Lane and Metro Camell in Birmingham. I remember us borrowing an International Coach prototype from Derby, to trial a traverser that floated on an air cushion, like a hovercraft. The idea was that the traverser could be skewed across the traverser pit to accommodate its longer length and perhaps float over it. Needless to say it wasn’t very successful.